I conduct educational outreach programs to schools and communities around Thailand's Khao Yai National Park to teach people about the importance of conserving the Park's plants and animals. I work in villages (such as Klow Nue in Prachinburi) that border Khao Yai National Park as well as in the WildAid Foundation office in Bangkok. The clouded leopard is a wild cat species which is the one of key species in the ecosystem. They need space for survival, finding food, and living safely. If they have a protected ecosystem that means other animals will be protected as well. So, anywhere where clouded leopard populations are strong, it means other species have homes too. By conserving clouded leopards, we also conserve other wildlife populations. So, wild cat species play an important role in conservation. I graduated from Ramkhumhang University , Bangkok in 1999. 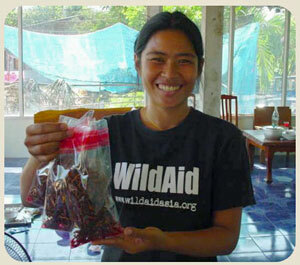 I volunteered for World Wildlife Fund Thailand and began working as an outreach officer for WildAid Foundation in 2003. To learn about wild cat species which are nearly extinct from hunting for use in traditional medicine, capture for the pet market, and changes in their environment including the loss of prey. I enjoy working together with others to to raise awareness for protecting wild cats. Yes, I think it can survive, but its very low numbers put the population at risk of extinction. Its beautiful fur makes it an attractive target for hunters. To conserve clouded leopards, we have to stop hunting them for use in traditional medicine, collecting, and export for the pet market. We should raise conservation awareness and realize that the network for protection will play a very important role for the clouded leopard's survival in the future. Write us a letter or poem or send us a picture sharing how you feel about clouded leopards! Caring is the key to conservation.